There are so many places among Bohol’s well-kept secrets. Kawasan Falls could be one of them. 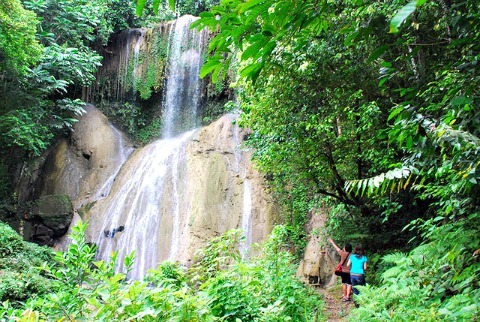 Concealed among the thick patches of forests bordering Trinidad and San Miguel, Kawasan Falls would not be among your expectations in unusually monotonous flat fields of barangay Santo Tomas, Banlasan and San Isidro. But, among the edges of these flat lands, grow a neat border of limestone hills with protruding boulders, lush forests, and the snaking brooks, these when traced leads you to a roaring falls. Of course, you’ll have a crudely carved dirt track for carabao carts on roughly hewn hillsides. At the end of the barangay road to scenic farming villages leading to San Isidro, is a newly-opened access which could make this mysteriously kept hidden falls accessible. But, it still could be off to your usual off-the-mill city buzz fugitives on four-wheeled vehicles. So, Kawasan. Making a spectacular impression with its gush from atop a 10 meter cliff which forms half for the limestone walls, the water flows off on to the south side of a deep pool, is Kawasan. Among Bohol’s least polished jewels glinting in the sun, Kawasan Falls is yet a raw treasure Trinidadnons try to carve a facet, and the little it did, has revealed already a tasteful enchantment the place exudes as you stand transfixed in the area. What’s unusual about the falls is the stone formations, boulders so huge you’d imagine these could be from the land of the giants abandoned in a hurry. The pool, a serene deep green has its shallow parts that show huge boulders beneath, the water spilling from the pool on to its long and gurgling journey to join the seas off northeastern Bohol. And it is bordered by lush vegetation, tall canopies of tropical broad-leafed trees conceal the gurgling flow of the brooks seeping out from the mystery of the pond. A challenging cliff rises from one of the pools' edge and poses a scaling dare enough for a struggling rock climber or an adventurous rock ledge scrambler. Its mystical, on the very least, you could tangibly feel the urge to just zip it, or talk in whispers lest you disturb the sacred tranquility of nature claiming a niche of the earth as its own. Welcome to Kawasan Falls, easy flowing ribbons of white water cascades and breaking off in three spreads of a splaying white frothy water dropping to a pool, some 10 meters below, while making a lulling tamed roar that makes this an endearing falls. Kawasan Falls own a ten-meter drop of water or so, spilling into a pool almost a hundred square meters. From a viewing deck that looks down on the pool not less than 10 meters below, the water is jade green to deep share of greenish olive, lending a more mystical air to the scene. But for the tired soul wandering on earth, looking for a perfect place to just sit and relax, take a cool refreshing dip, or have a splashing massage from the falls gushing drops, it is Kawasan. It has to be. Lacking still of a sizable investment to transform the place into a perfect tourist destination, the town dangles one of its secrets to a tourism development, in a bid to enhance its local revenues and snowball a local poverty alleviating industry.